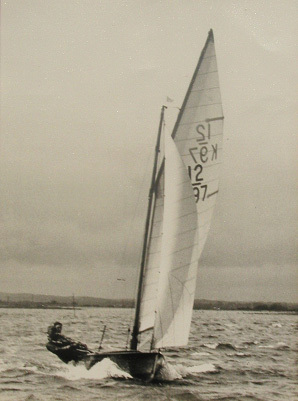 Photos below were taken in 1955, when the Sharpie was an Olympic boat and our local representative at the Olympics was Charles Curry, who lived at Bosham. There was a large Sharpie fleet with several based at Dell Quay. We had International races against British, Dutch and Portuguese helmsmen. It was during these times that Tim Farwell smashed into us on the wrong tack, throwing me over the side, as I went over I heard Arthur Doman, my skipper say "Farwell that's kid's sailing". The actual picture was taken during Connaught week in 1955 and shows me as crew and Arthur Doman on the helm, with Bluebreeks planning. It was named after Arthur’s daughter, the 12 square metres Sharpie had white sails, black numbers, light varnished mast and spars. Medium mahogany hull finish, very highly polished and deep blue beneath the waterline. The Darley Brothers at Itchenor always maintained this finish to a high standard. Her number was K97 and she remained in the harbour for many years. It may still be there as far as I know. Other owners of sharpies at that time were Gavin and Fred West and as I mentioned there was a large fleet in the Harbour.